How often have you taken an online course and remembered every single piece of information you consumed immediately afterward? Probably never! That’s down to the Ebbinghaus forgetting curve. Ebbinghaus’ forgetting curve depicts how quickly we forget information over time if we make no attempt to retain it. For L&D professionals, this presents an obvious challenge. Investing time and money in course creation and training is ineffective if your learners aren’t absorbing what they learn and applying it to their work. Let’s explain the forgetting curve in more detail and discuss 5 ways you can tackle it in eLearning to help your learners get the most from their training. 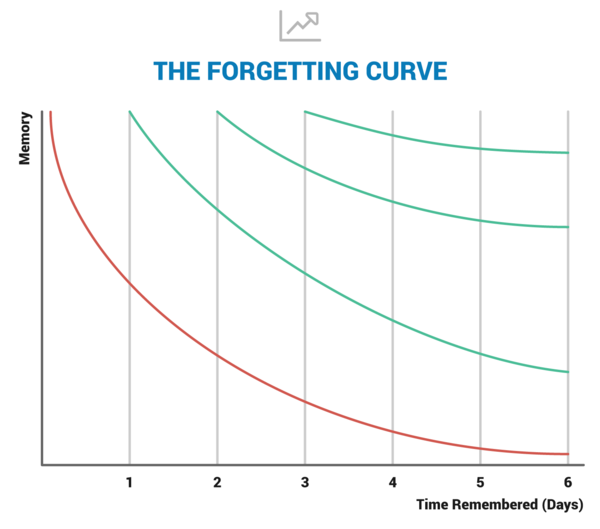 You’re probably more familiar with the forgetting curve than you think. The effects can be seen in everyday life, not just in eLearning. Let’s say you’re at a networking event and a potential customer gives you their contact number which you write down on a piece of paper. If you lost that piece of paper, would you remember the phone number an hour later? Probably not. So, before we try to combat the forgetting curve in eLearning, let’s specify exactly what it is. The forgetting curve is a mathematical formula by Hermann Ebbinghaus that originated in 1885. The curve depicts the rate at which information is forgotten over time if there is no attempt to retain it. Basically, learners will rapidly lose memory of learned knowledge in a matter of days or weeks unless the information is consciously reviewed. Some studies suggest that humans forget approx 50% of new information within an hour of learning it. That goes up to an average of 70% within 24 hours. However, the rate at which a person forgets is dependant on a number of factors including memory strength, how meaningful the material is, and physiological factors such as stress. The good news is, there are a number of methods you can use in your eLearning courses to help your learners challenge the forgetting curve. In order to thoroughly understand what is learned, there are two important elements to consider. One is time. And the other is the application of repetition. This can be achieved with spaced learning, which is why it’s considered one of the optimal methods for combating the learning curve. Spaced learning helps learners manage what learned information is retained, enabling them to reshape the forgetting curve. In turn, spaced learning benefits organizations as it supports retention of skills and increased productivity in the long term. Let’s set out what exactly spaced learning is. It’s a learning methodology where learners are presented with material they have to learn in a timed session, with a short break provided after they’ve completed it. Spaced learning strengthens memory retention because the learner studies the information, and periodically returns to review it in order to retain the knowledge. The learner also practices retrieving the learned information using different formats such as solving problems, completing exams, etc. This reinforces what has been learned and battles the forgetting curve. Spaced learning can be tailored to suit your eLearning needs. The spacing can occur within a single course module, or by scheduling modules and courses several hours, days, or weeks apart. By using bite-sized chunks of content and demonstrating the required information repeatedly in different, creative ways, like blended learning, learners are more likely to absorb the information. If you want your training content to stick, you have to make access to courses convenient for your learners. Let’s say one of your learners is at a conference and needs a refresher on a piece of information they previously learned, and they need it now. Urgency means there’s no time to get to a computer, sit down, turn it on, log into an LMS and comb through courses in order to access the required information. Since fighting the forgetting curve is all about repetition, ease of access to course content is paramount. That’s where mobile learning, or mLearning, comes into play. Ensuring your LMS is mobile compatible makes learning and retaining information easier for your learners. Learners have a better chance of recollecting and refreshing their knowledge if they can access their courses when and where they like; on the bus to work, or while waiting on a client for a lunch meeting. Of course, it’s always better to be proactive than reactive. When planning out course content, keep the forgetting curve in mind and make the information easier to digest from the get-go. Learner concentration naturally wanes if they’re reading mountains of text, reducing knowledge retention. Mix things up and keep your learners interest by varying the content you’re using with videos, images, and webinars. Even better, go the extra mile by having your learners actively participate in the course, rather than being passive observers. If you want to beat the forgetting curve, gamification is the answer! Motivators through gamification come in the form of winning and rewards. Gamification takes the mechanics of games and applies them to other activities, like eLearning. Gamification can be used to motivate your learners to complete the required learning. And because it’s interactive and gets your learners engaged, knowledge retention is more likely. Examples of gamification elements you could utilize in your eLearning include badges, points, levels, and leaderboards. Learners are more likely to engage in training and retain relevant knowledge if you create a learning culture within your organization. Whether it’s formal training via an LMS or informal training via knowledge sharing at the water cooler, learning should always be happening. If your company carries out mandatory isolated training events every now and then, it’s probable that the forgetting curve will get the better of your learners. By creating a learning environment and running frequent training events, you’ll help reinforce training and increase the amount of knowledge that’s retained. From a practical point of view, you can encourage your learners to embrace this learning culture by making it as enjoyable as possible for them. Tips to achieving this are by creating engaging course content with a great UX, and delivering it to your learners through an easy to use LMS. Actively support knowledge sharing within your organization, whether it’s through training days, workshops, or a thorough onboarding process. Once your learners recognize that frequent learning and reiteration is part of your organization’s daily routine, they’re more likely to engage in training and retain pertinent knowledge. The human brain is selective and has a limited capacity. When it comes to deciding whether to store particular pieces of information permanently, the brain can be quite choosy. And this naturally accelerates the forgetting curve. That’s why, when planning training, you should make it as relevant to the learner as possible. The more relevant the training, the easier it is to retain and remember. In order to become fully engaged in training, your learners may often want to know why they need the information presented in your courses. If the information is relevant, the learning experience becomes more meaningful, which makes retention more likely. So, how can you apply this to your eLearning content? Make the course content relevant to your learners’ job function or role by including examples or scenarios that they experience every day. If you want learners to know new information or gain advanced skills, try to relate the training to information your learners already know. Now that you have 5 great tips for challenging the forgetting curve, you’ll need a great LMS to apply them. Your LMS should allow you to carry out creative repetition through various mediums in addition to supporting blended learning, spaced learning, mLearning, and gamification.